The cost of outsourcing our public discourse to private platforms. 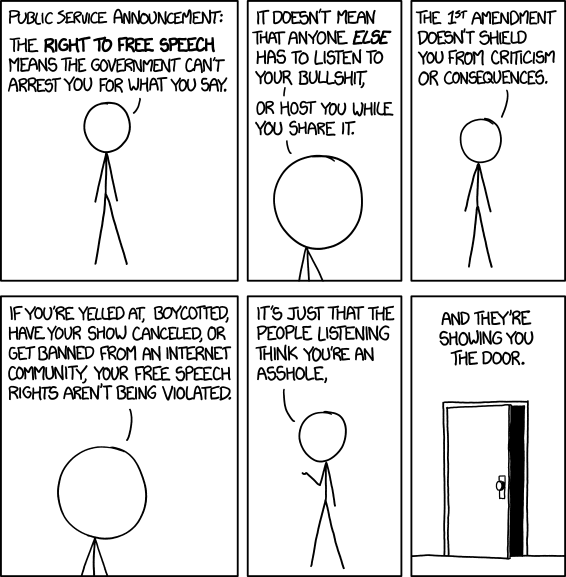 Person 1: But what about free speech? You’re censoring this party! Person 2: [Twitter/Facebook/Youtube/etc.] is a private platform! Free speech guarantees the right not to be jailed for what you say, not the right to have it on every platform you want. But while this is all true in some sense, it also seems to me to be missing the larger and much more important point. Namely: the whole reason we have these arguments—and the reason people tend to think as they do about the “free speech” question in these situations, legally nonsensical or not—is that we have outsourced the vast majority of our public discourse to these private platforms. Twitter and Facebook have become the de facto public fora of the 2010s, with Google’s search results and Wikipedia’s summaries taking similarly authoritative roles on what exists and what is true. Not that most people would put it that way, but it remains true: if something isn’t in Google search, it might as well not exist on the internet, and therefore for many people at all. Likewise with Wikipedia’s summaries: the admonitions of every college professor in the world notwithstanding, what Wikipedia says has an undeniable authority. And when someone is blacklisted from Twitter or Facebook, their ability to be heard at all by internet users as a block is dramatically curtailed. This centralization of discussion and information into a few private platforms has a great many downsides. But perhaps chief among them is that we have ceded major aspects of our public and civic life to private platforms, and their interests are not the interests of the public good. They are driven almost entirely by the profit motive, or (possibly even worse at times) by nebulous and chimeric ideologies that treat “connecting people [digitally]” or “organizing the world’s information” as inherent and superlative goods. So when someone has their page removed from Facebook, or their website blacklisted from Google, there is a real sense in which they have been removed from public discourse and their speech “silenced”—even if not in an illegal sense. For the purposes of this post, though, I could not care less what the major internet companies do or don’t show on their platforms. Instead, I worry about our practice both as individuals and also as communities-of-practice—churches, associations, and so on—of abdicating our responsibility to maintain real public and civic lives in our local places in favor of letting these corporate giants do the work for us. I worry about the costs of letting Google and Facebook replace genuine public fora in our lives. I worry about the long-term effect of letting supranational megacorporations driven by that toxic combination of profit motive and nonsensical ideologies set the terms of our lives. I worry about the whole set of underlying structural and systematic moves that have made delisting on one of those platforms seem like a violation of the ideal of free speech. As I’ve said for many years in this space: we should work hard at reclaiming our lives from the tangle of the corporations. We should limit the way we both use and think about these platforms. We should read books, old and new, rather than simply rely on the Google results and Wikipedia summaries. We should have painful, awkward conversations and indeed arguments with neighbors and colleagues and family members rather than merely all-caps shouting at each other on Facebook or Twitter. We should carve out our own spaces on the internet, owning our own turf; but more than that we should remember that even that is no substitute for the thicker (and yes, more painful, frustrating, and awkward!) communities and interactions of a church or a neighborhood or a town hall meeting.